For most people, getting crazy with s'mores involves adding peanut butter or bananas. But one unhinged New Zealander brought plenty more crazy to the party when he decided to roast his marshmallows on AN ACTIVE VOLCANO. On a recent trip to the Marcum Crater -- a volcanic vent in Ambrym, Vanuatu where temperatures reach a ridiculous 1,999 degrees Fahrenheit(!!) -- daredevil Simon Turner decided to settle down for a hot snack. Because hiking up a volcano really takes it out of you, after all. 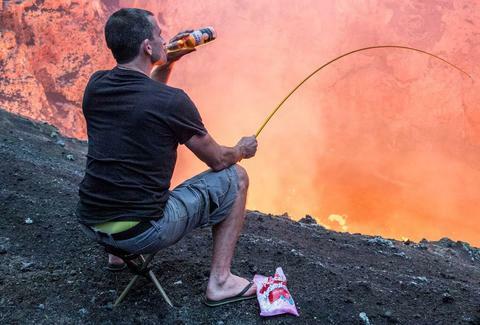 Filmed by his buddy/volcano know-it-all Bradley Ambrose, Turner tacked the marshmallows onto a tent pole, and hovered them over a scorching lava lake bubbling just a few feet from where he was sitting. The 'mallows were apparently cooked to perfection. “It ended up being one of the most perfectly-cooked marshmallows I have ever tasted,” he said. We'd tell you not to try this at home, but you probably don't live on a volcano anyway. Watch the crazed camper eat candy and kick back with a Corona on top of a freakin' volcano in the video below, set to elevator music. Chloe Pantazi is an editorial assistant on Thrillist's travel team, and including a Reese’s peanut butter cup is her idea of an adventurous s’more. Follow her on Twitter @ChloePantazi.